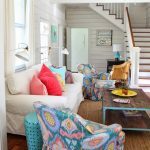 I almost drooled all over my June issue of Coastal Living when I landed on the article “New House Old Soul” showcasing a vacation home in Georgia designed by Jane Coslick and photographed by Richard Leo Johnson. Gosh I love Jane. We’re getting pretty close to perfection here people. I think this could easily be my dream vacation home. I see these images and I wonder why in the heck I live in Minnesota. “The Land of 10,000 Lakes” just doesn’t seem to cut it! WOW! What a place huh? I love it. Everything is just so peaceful and serene! I just found your blog the other day and boy, am I glad I did! 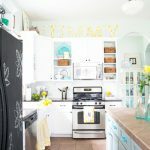 Love your style and this house is to die for! so beautiful! I love the shower with the seashells sitting on top of the ledge! I am from Iowa and I beg my kids to move somewhere warm with me and they refuse! Maybe when we retire I can have a winter home somewhere tropical! 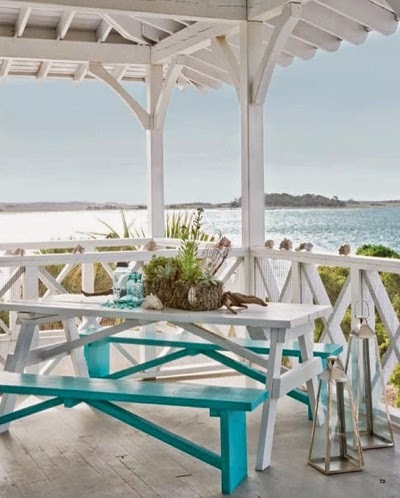 Love this beach cottage too. The "mud" room near the stairs is fantastic. Love the painted floor and closet doors. This house IS perfection. That fridge! And the cushions on the porch furniture. And the shower…. Oh man, it's too amazing. It can't be real. This house is perfect! My God I think it has become my dream summer house too! Beautiful, thank you so much for the introduction! I noticed that she uses this chandelier in several of the homes she has designed. I think it is by Arteriors home – I have seen it in the mart here in Atlanta. Oh…why thank you! You are certainly welcome ANYtime! This is STUNNING. I love the outside verandah. While I love love love Turquoise/blue I would never have put lime with it (not a favourite of mine) but seeing these photos I've change my mind. Adore your site – delicious. 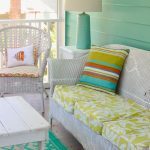 Loving the pale blue on the wrap-around porch! yes, this is just about perfect!!! Love the tile in the shower! And the kitchen, ooooOOOHH! I am definitely completely drooling… amazing!!! That stove, the fridge, the backsplash & just when I thought I was going to die…the porch, the cushions & the view. It just blew me away like the oceans breezes that wisp & wisk you away on those fabulous cushions. I lov the ottomon & how that super stripe tossed a bit here, a bit there throughout the house. Great find, Erin. Super thanks!!! Oh & I say we just knock on the door & announce we're hanging out for the weekend. This IS perfection, to me! I'll be going back to this again and again. 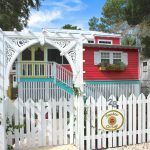 I found her web site last year and immediately wanted to buy a shack on the beach and redo. If we ever build again, this is the way I'm going! I love this place! 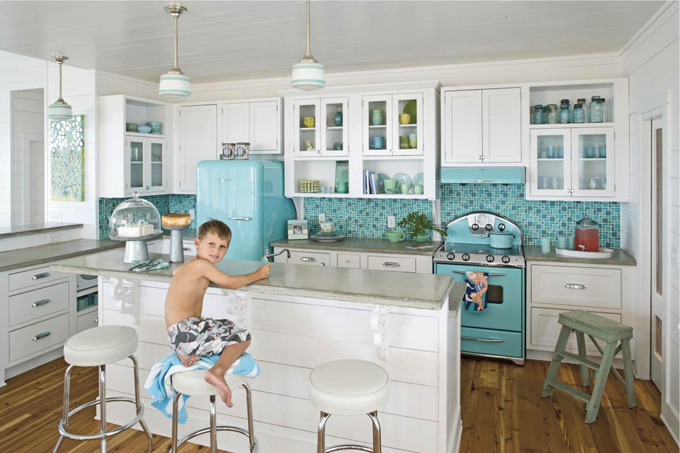 Just showed my mom the kitchen with the turquoise refrigerator and stove….I think she wants them both now!!! OMG, I love this house! 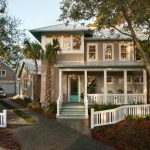 Coastal Living magazine rocks! Love it, love it, love it! 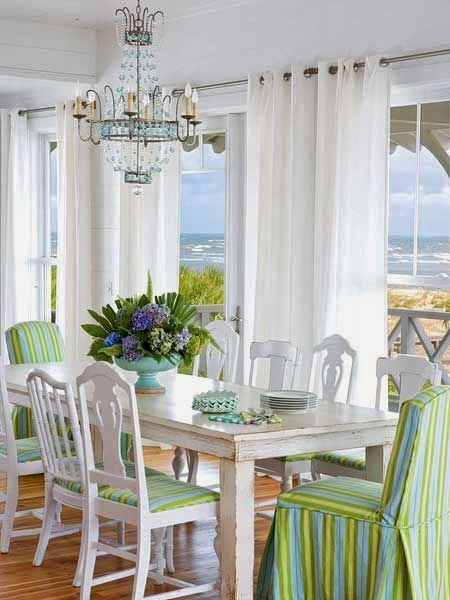 Love, love, love this beach cottage! 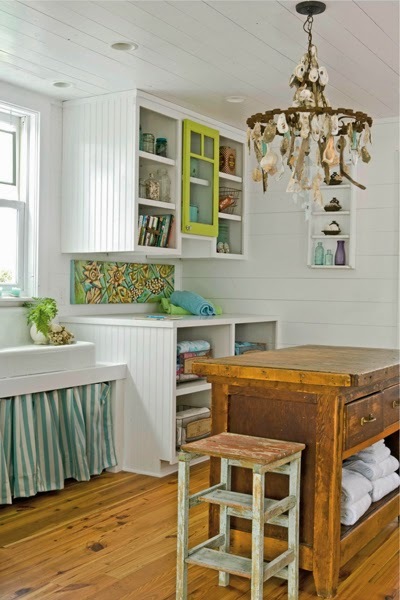 The large turquoise and lime tiles in the mud room are to die for! I could live there happily for a very, very long time! Thanks for sharing!